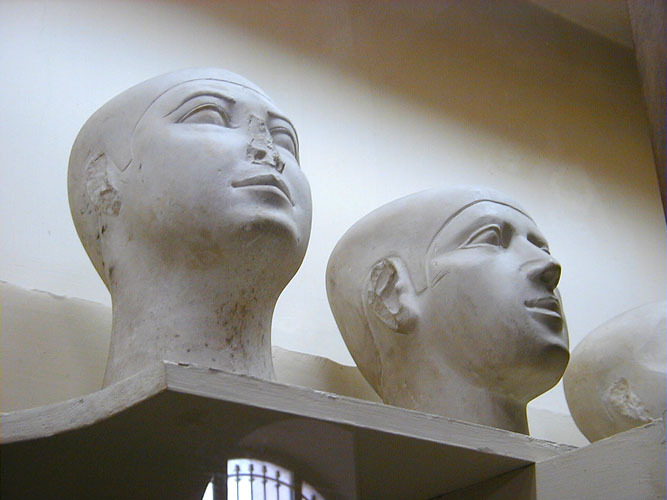 Ancient Egyptian reserve heads are theorized to have been made to replace a person's damaged head. I like that idea. See http://educators.mfa.org/galleries/slide_create/744?page=11. We’ve all heard of anniversary syndrome—that creeping feeling you get when a date on the calendar approaches that used to be important or on which some terrible event took place. We may not even realize that the date on which someone died is looming—we don’t keep track of those on our calendars the way we do birthdays—but our bodies remember. We feel sick, we get headaches, we may just be in a bad mood, jumpy or weepy. I am always amazed at what the body remembers and how it is so likely to respond to the past right in the present. A couple of weeks ago, Bruce and I were rushing around getting ready to go somewhere. I’d been standing at our bathroom vanity valiantly attempting to style and blow-dry my hair, something I’m terrible at and that takes me an absurd amount of concentration. Unbeknownst to me, Bruce had opened the top door of the cabinet next to me, and when I turned with some haste to go back in the bedroom and finish getting dressed, I hit my head on the cabinet door. It hurt, true, and I was annoyed at him for leaving the door open, but neither of those things should have led to the shriek I let out. I grasped my head and staggered to the bed, where I leaned forward, moaning and screaming. When Bruce tried to comfort me and apologize, I would have none of it, but continued rocking forward and back, holding my head. Tears poured from my eyes, streamed down my cheeks, and dripped off my chin. I couldn’t catch my breath I was keening so hard. I reminded myself of the widow Emilie loudly grieving her husband’s death in Bergman’s Fanny and Alexander. I went on and on. The whole thing was ridiculous. But then I realized that this was the first sudden pain I’d had in my head since the brain hemorrhage. I was re-experiencing the terror of that event without the seriousness that had made me stay in control during the real thing. After a few more gulps of air, I calmed down and stood upright and went looking for Bruce, who had fled to the garage. When I explained my reaction, he hugged me. We agreed the short episode had been a little like being lost in a really scary funhouse—that was me in the mirror, but it was hard to recognize her. Afterward, I felt the same kind of relief I’d had when I’d learned that my brain hemorrhage would probably not kill me—as if my body were lighter and warmer than before, almost floating. In a few short minutes, I flashed through a month’s worth of emotional phases. And I came again to my resolutions to focus on what’s really important to me. Maybe that’s one thing anniversary syndrome is good for.